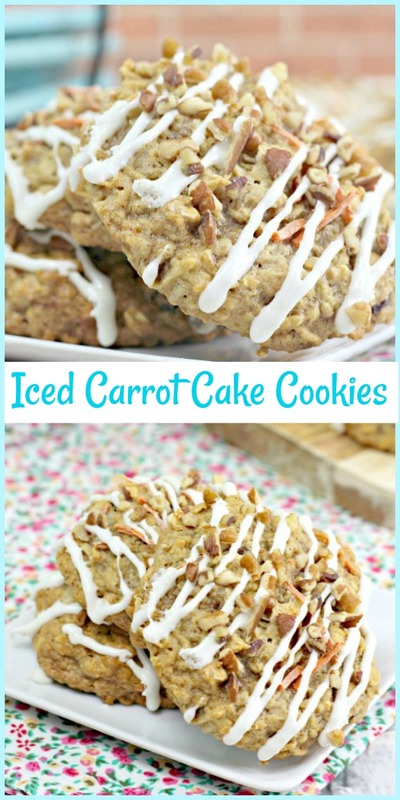 Iced Carrot Cake Cookies – Here’s a delicious, moist cookie that tastes just like a carrot cake but in a portable size. It’s a family favorite around here that’s sure to become one around your home too. Take a bite and enjoy the deliciousness! Cooled, iced, and ready to eat! Preheat oven to 350 degrees, line a cookie sheet with parchment paper. Set aside. Using a stand or hand held mixer, beat together the butter, brown sugar, and granulated sugar until light and fluffy. Beat in the eggs, one at a time until combined after each egg. Add in the vanilla until combined. Gradually add in dry ingredients into the wet until combined. 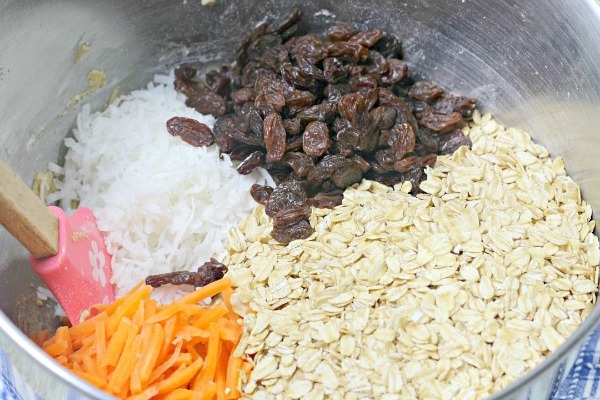 Fold in carrots, raisins and oatmeal with a rubber spatula until combined. Make sure you dig down to incorporate all the ingredients into the batter. 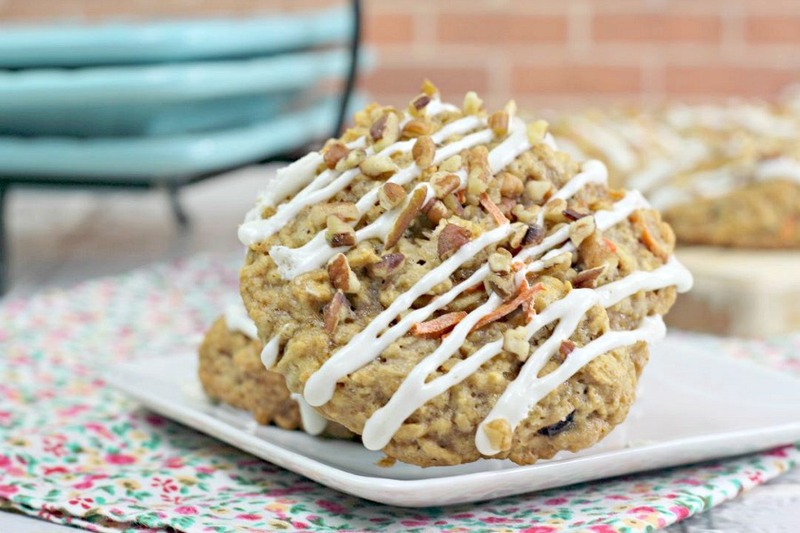 Using a medium to large cookie scoop, scoop out mounds of dough onto the cookie sheet. Bake for 15-17 minutes or until lightly golden. Allow to cool completely before baking off the remaining cookie dough. For the icing, In a large mixing bowl and hand mixer, beat together the cream cheese, powder sugar, milk and vanilla until combined and smooth. 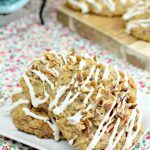 Using a fork, drizzle icing over cooled cookies and sprinkle with chopped pecans. ( You can put icing in a squeeze bottle but I like the fork method. 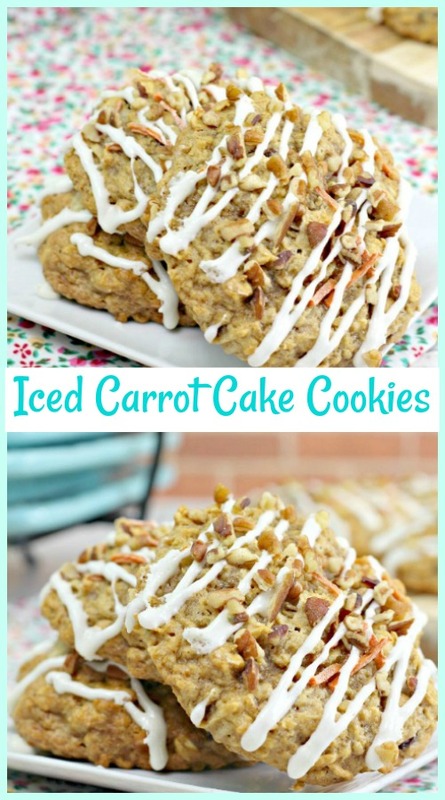 Allow icing to harden for about 1 hour before grabbing your first cookie! 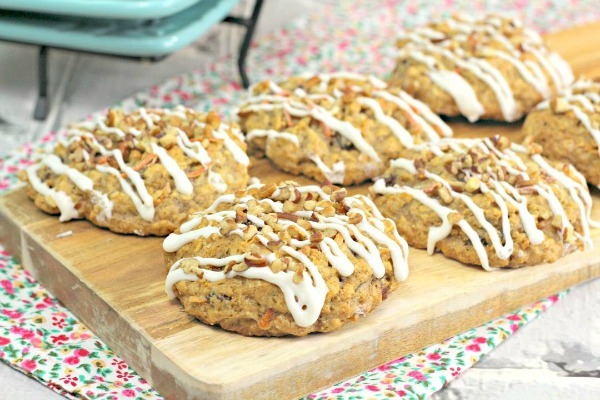 Here’s a delicious, moist cookie that tastes just like a carrot cake but in a portable size. It’s a family favorite around here that’s sure to become one around your home too. Take a bite and enjoy the deliciousness! 1.Preheat oven to 350 degrees, line a cookie sheet with parchment paper. Set aside. 2.In a large mixing bowl, whisk together the flour, baking soda, cinnamon, nutmeg and salt. 3.Using a stand or hand held mixer, beat together the butter, brown sugar, and granulated sugar until light and fluffy. 4.Beat in the eggs, one at a time until combined after each egg. 5.Add in the vanilla until combined. 6.Gradually add in dry ingredients into the wet until combined. 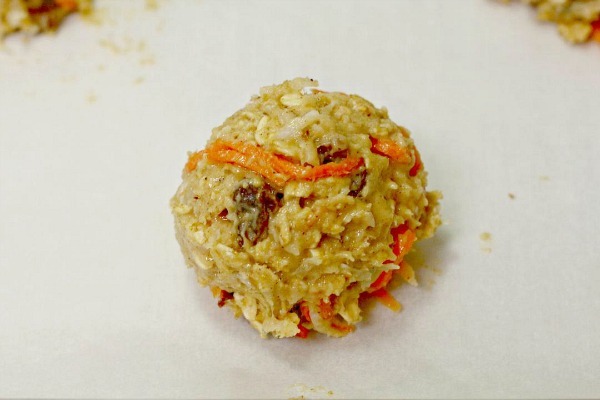 7.Fold in carrots, raisins and oatmeal with a rubber spatula until combined. Make sure you dig down to incorporate all the ingredients into the batter. 8.Using a medium to large cookie scoop, scoop out mounds of dough onto the cookie sheet. 9.Bake for 15-17 minutes or until lightly golden. 10.Allow to cool completely before baking off the remaining cookie dough. 11.For the icing, In a large mixing bowl and hand mixer, beat together the cream cheese, powder sugar, milk and vanilla until combined and smooth. 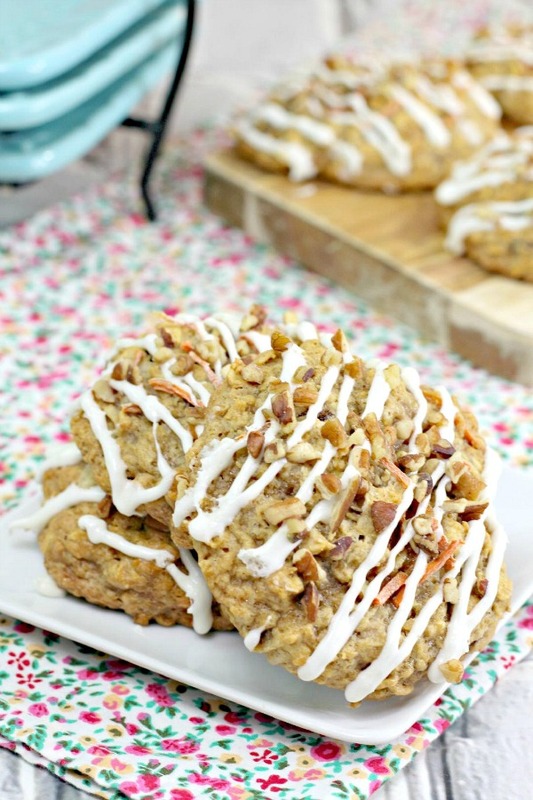 12.Using a fork, drizzle icing over cooled cookies and sprinkle with chopped pecans. ( You can put icing in a squeeze bottle but I like the fork method. 13.Allow icing to harden for about 1 hour before grabbing your first cookie! Enjoy! !